Erin Chiswell is a board certified Family Nurse Practitioner with more than 15 years of emergency and acute care nursing experience. She became a nurse practitioner in 2006. Dr. Chiswell received her BSN, MSN and DNP form the University of Kentucky. 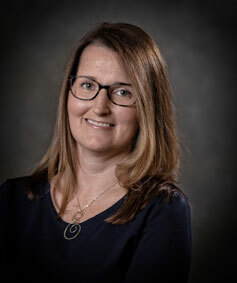 She began teaching full-time in the College of Nursing in 2016, after earning outstanding student evaluations as a part-time clinical instructor for first semester sophomore BSN student from 2014-2016. she currently teaches NUR 540, Health Care Systems from an Interprofessional Perspective and the Skills Lab portion of NUR 211, Fundamentals of Adult Nursing Care. She also assists with the Graduate Leadership and FNP-DNP programs. She served as a teaching Assistant in the DNP Health Assessment course from 2015-2016. Dr. Chiswell continues to provide patient care as a family nurse practitioner with the Lexington Clinical in both Lexington and Nicholasville. She is a member of several professional organizations. Her DNP focus was antibiotic stewardship, and her clinical interest is leadership.